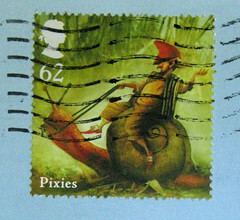 The fabulous PostMuse made my day, and made my Hanukkah, with this: the best Hanukkah card ever. I can't find a direct link to the card, but it is from Alternate Histories. 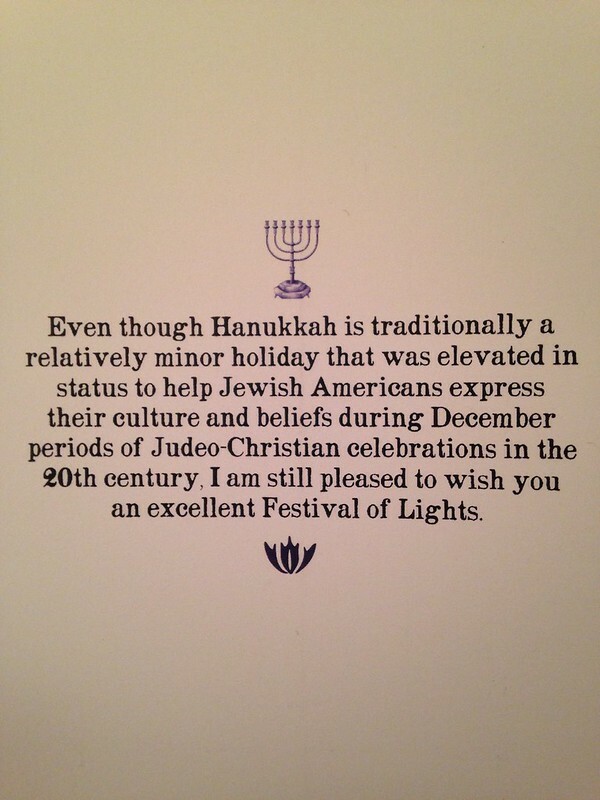 You may have read my On holiday cards page, so you may know I'm not big into holiday foo-fa-la, and I get especially grinch-like at the misconception that Hanukkah is as big a deal for Jews as Christmas is for Christians. It's actually a very minor holiday. But lighting candles is fun (I love candles), and PostMuse got it spot-on with this wonderful card! We're enjoying "kittens' first Hanukkah" in our household. Oberon has a healthy fear of candles, but Stella exhibits a morbid (and slightly masochistic) fascination with the flames. 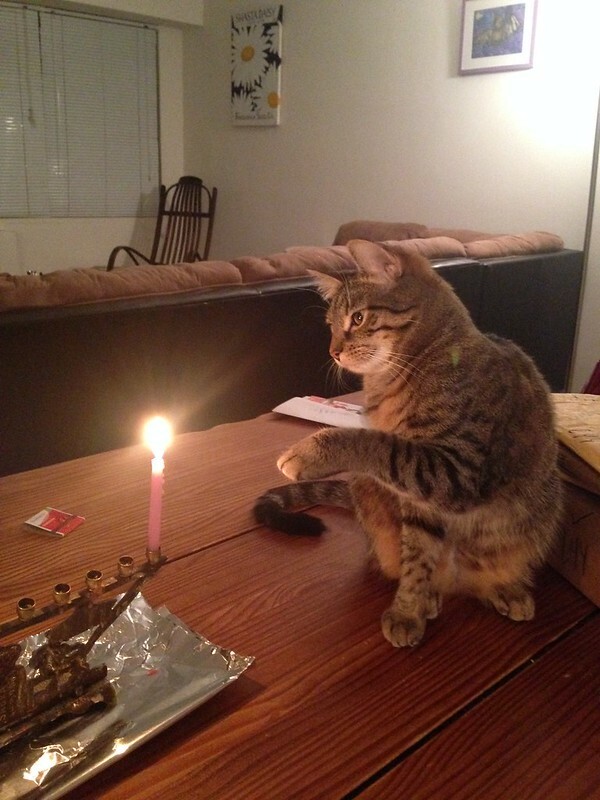 On the first night, she ended up extinguishing the candle by pawing it. After we wiped her paw down with a cool cloth, she was right back at the Menorah for more action. Fortunately, last night she slept through the candle lighting. Wish us luck with Stella and fire safety throughout the rest of Hanukkah and the future. Happy Hanukkah, everyone! Chag sameach to all who celebrate the holiday. Oh my goodness! Stella is living up to her name! I suppose it actually means "star" but it is a bright light, just like a candle. I'm so glad you love the card! Oh WOW, PostMuse - I never even thought of that! Stella is clearly well-named. Oh I love that card! Perfect! My sentiments exactly. But we do like candles, too. Lit them twice so far, for our grand girl, and she them a lot. So far, Bizoo cat has no interest in them. Stella is one risky taking feline! Stella is a beautiful kitty. I must agree, this is the best holiday season (or, as I refer to it, headless chook season) card I have seen in a really long time. Maybe ever. I really love it. May your head remain firmly attached this season.